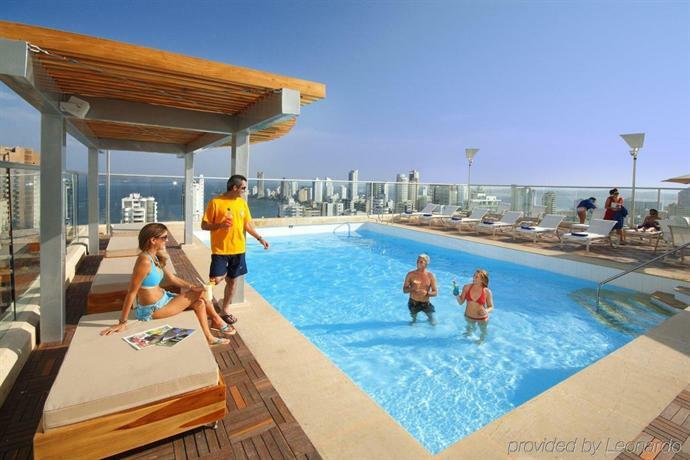 Located on the 21st floor of the Capilla Del Mar Cartagena the rooftop pool and solarium offers panoramic views of the Cartagena cityscape and the Caribbean sea. The outdoor pool features soft day beds, soft chaise lounge chairs, sun umbrellas, free wifi, a shaded pool deck, sophisticated lighting, and a pool side bar. The pool side bar serves a variety of exotic Caribbean cocktails as well as light fare. The pool is open 9:00 a.m. to 8:30 p.m. Sharing the 21st floor is the El 21 Bar, an oval shaped rooftop Sky Bar, featuring craft cocktails and a nightly DJ. El 21 Bar is open Thurs­day to Satur­day from 7:00 p.m on.